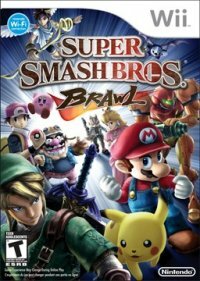 Super Smash Bros. Brawl is a massive game that features the all-stars of Nintendo's many franchises coming together for a massive fight. This game is one of the biggest and most anticipated games in Nintendo's history. Primarily, Smash Bros. Brawl is a multiplayer slug fest. With 35 characters and 41 stages to go through, it is sure to provide endless hours of entertainment. Added ontop of that is an online mode to battle your friends as well as random people online. It also has an added Stage Builder so you can make stages as you please with an infinite amount of combinations, you will never get bored of stages again. There are loads of collectables in the game as well. Not only are there trophies, but there are now Stickers of almost anything you can imagine from the Nintendo game series, which also help out in the Subspace Emissary. There are also CDs which have music for use on all the stages. Theres even a mode that utilises your coins to obtain Trophys and Stickers through a mini-game. It also has a mode where you can play short demos of the games that the characters from the game are from. This way you can really brush up on your history and maybe even introduce yourself to a new game series that you previously wouldn't have touched. Smash Bros. Brawl just has lots to do and will keep you occupied for months, maybe even years.